Comrade Adamu ha sorry. 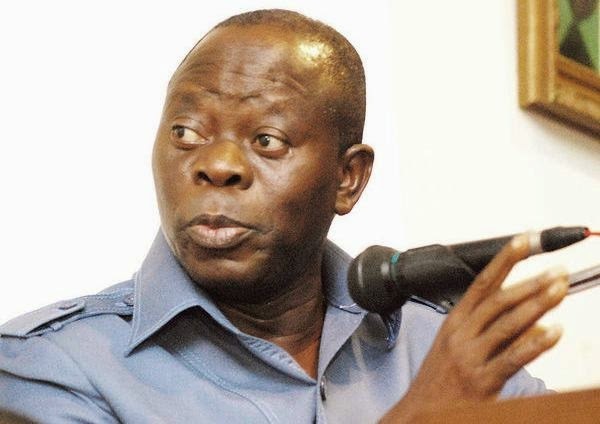 Comrade Adams Oshiomole the Edo State Governor seems to be singing aloud so much lately considering his reported lackluster achievements as the Edo State helmsman for the last eight years. In his latest venomous rhetoric's Mr Adamu is alleging that some pastors have collected money to preach against APC Presidential candidate, Gen Buhari. Oshiomole made the allegation while receiving a PDP Chairmanship candidate and 2000 PDP members who defected to the APC yesterday March 9th. "Some pastors after collecting money are now preaching that Buhari wants to convert the nation to Islam. When Buhari was Head of State with absolute power, did he convert Nigeria to Islam? Did he convert Dodan Barracks to Islam enclave? Are there not Christian Generals all over the place? The issue of this election is not about religion or tribe. It is about who has what it takes to repair our country. It is about who will give us light. If PDP couldn’t give us light in 16 years, shouldn’t we give it to someone else? Take a critical look at this election, when NEPA takes light, do they segregate between Christians and Muslims? When they bring fixed charges, do they differentiate between Christians and Muslims? Are both Christians and Muslims not suffering the inefficiency of PDP’s 16 years of mis-governance? They are saying APC is a Muslim Party. How can a party that parades Christians such as me, Chief John Oyegun, Prof Osinbanjo and many others be described as a Muslim Party? Now let’s look at it, if Nigeria’s problem is about religion, since 1999 till now, Christians have ruled the nation for 14 years, how come if it is really about religion that despite ruling for 14 years, Nigeria that ought to be like heaven is still like hell? Nobody should use God’s name to deceive the people. The matter of governance is not about what you claim but about the state of your heart. In this state, from 1999 till now, all those that have governed Edo State are all Christians yet those that governed from 1999 till 2007 did nothing. Are we not all Christians but is it all of us that worked? They even stole from Church because when you do not pay salaries for 3 months can the workers pay their tithe? In Edo State, Christians, Muslims and Traditional worshippers live together in peace and harmony. Across Edo State you find people of different religion and nobody should bring religious war to Edo State. While appealing to the people to jealousy guard their PVCs, Oshiomhole said: “In this local government we have always won and in this 2015, we will still win. PDP has destroyed Nigeria and we must vote them out. Now they are planning how to rig the election but it won’t work. If anyone approaches you to sell your PVC, do not sell it. Don’t sell your voting right for one meal. When they approach you to exchange your PVC for money, refuse and let them know that your poverty cannot be negated for stupidity. This month of March, by the Grace of God we are marching to victory.” Leader of the decampees, Chief Edegbe Ugbogbo said he went to test the PDP but couldn’t cope and assured the Governor that he will collaborate with the APC leadership to sustain development in the state as he is very impressed with the developmental strides of the State Governor. “I am here with my followers to formally return to the All Progressive Congress and come March 28th and April 11th, 2015, we will ensure that APC wins in all the wards of this Local Government.” he said.